Today, 14770 yen on Amazon Japan. Looking to sell mine. She's been displayed in a detolf case and will come with her original box, looking for $80 shipped. PM if interested. US shipping only. 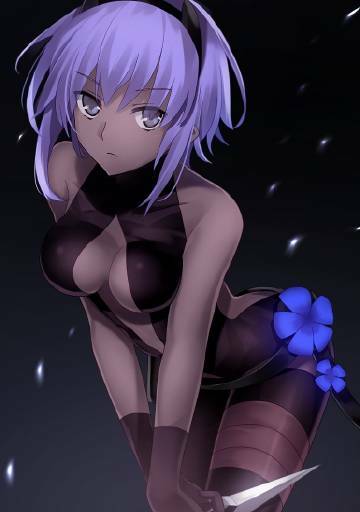 Her face seems strangely different compared to her look in FGO and Prototype. If it weren't for that I would buy this without hesitation, but as is I'm not sure I will. Just picked mine and even though it's a simple figure I love that about it. I attempted to insert the skull head so I could see which I liked the most but it wouldn't fit. The normal head went in and out without any problem but the skull one is a lot thicker when I compared them. I guess it would be easy to just trim the plastic a bit but I prefer the normal head anyway. The figure itself is well sculpted but the parts fitting is rather awkward to fit into it's sockets. The skull front hair piece is very hard to get in all the way and the color purple seems to be slightly different shades on her bangs and main hair. Might just be mine those. overall, B.